Imagine streets that wind through quite neighborhoods of homes set back from the road. Add beautifully landscaped Floridian flora and foliage. You are imagining that you are in the country. Actually, you are near the heart of Naples in the community of Berkshire Lakes. The community was planned to create exactly the picture you have imagined. Berkshire Lakes occupies acreage on both the east and west sides of Santa Barbara Boulevard at the intersection of Radio Road. Nearby is the point where Interstate 75 defies its north-south, odd-number designation and heads east through the Everglades toward Ft. Lauderdale – the stretch of road also known as Alligator Alley. Berkshire Lakes is a “deed-restricted community” governed by neighborhood HOAs to ensure that the harmonious blend of architecture and landscaping is maintained for years to come. The luxurious Shores is a gated, residential neighborhood on the east side of Santa Barbara Boulevard. The Master Association Clubhouse is available for the use of Shores residents. Other neighborhood amenities include Har-Tru tennis courts and a heated pool, although many Shores homes have their own private pools. The walking/biking path wends its way alongside two of the largest lakes in the neighborhood. Homes in the Shores range from 2,300 to 4,500 square feet and have up to four bedrooms. The neighborhoods on the west side of Santa Barbara Blvd. include single-family homes, attached villas, and seven neighborhoods of condominiums. Newcastle is a gated neighborhood offering 278 three and four bedroom condominiums with two to three baths in 35 low-rise buildings. Windsor Place is a neighborhood of 116 coach homes with attached garage. With just four homes of up to 1,400 square feet, there are only 29 buildings in Windsor Place. Each home faces either the preserve or the heated pool. The Colonies condos are conveniently located near the clubhouse. The eight two-story buildings house 78 comfortable homes similar in size to those in Windsor Place. Residents of the Colonies have what is arguably the best views in the Berkshire Lakes Community (if not all of Naples), with panorama that permits the welcoming of the sunrise as well as the magnificent sunsets that have made Naples famous. There are 148 homes in the gated neighborhood of Partridge Pointe. Situated in 12 buildings, each unit has an attached garage and is comparable in size to those in Newcastle, Windsor Place, and the Colonies. Partridge Point was built between the shores of Lake Belville and the adjacent preserve. The 168 residences of New Waterford are more intimate 1,200 to 1,300 square foot condos occupying 21 buildings that adjoin either Lake Waterford or Belville Lake. The community pool is a unique feature of New Waterford, accessible by land from the west and by a walking bridge from the east. Homes in Countryside range from 1,000 to 2,000 square feet, and are available in either three bedroom/two bath or a four bedroom/three bath floor plans. Melrose Gardens is the only neighborhood within Berkshire Lakes comprised entirely of attached villas. Floor plans start at 1,700 square feet and each unit has an attached, two-car garage. There are 72 homes in Melrose Gardens. As far as convenience is concerned, there are five banks in the Berkshire Commons just outside Berkshire Lakes. The Commons is also home to a Walgreens, a Publix supermarket, and a Beef ‘O’ Brady’s. Florida Highway is only two miles to the east. Take a right turn and a short drive and you’ll be on Marco Island before you know it. 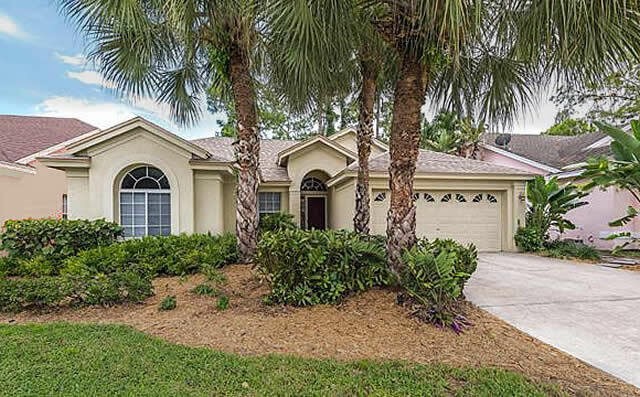 Everything that is Naples, Florida – golf, shopping, dining, and the beaches is only minutes away from Berkshire Lakes.